Reading is a great experience. It is easy, affordable and can take place nearly anywhere. Reading taps into your imagination and allows you to experience life from viewpoint of others. It is a great way to pass the time when you are traveling or stuck in a waiting room. Here are some wonderful quotes about the experience of reading that we have collected. "The more that you read, the more things you will know. The more that you learn, the more places you’ll go." - I Can Read with My Eyes Shut! by Dr. Seuss. "A reader lives a thousand lives before he dies, the man who never reads lives only one." - George R.R. Martin. He also added to his World Book Day tweet, "or dies a thousand deaths.."
"A book is a dream that you hold in your hand." - Neil Gaiman. 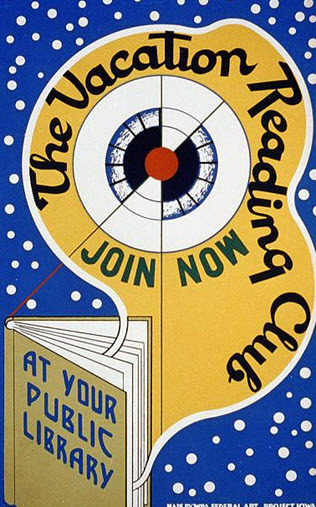 Reading is a great way to escape from life as this poster from the 1930s suggests. It was created by the WPA Federal Art Project. You can see a larger version here. *Note: The image above is thee Main Reading Room at The Library of Congress Thomas Jefferson Building. You can see a larger version of the image here. See also our collection of Quotes about Writing.